For this months "Grandma and Me" post, Alethea and I are sharing what we wore to Chicago's Field Museum when I was visiting the kids last February. Sorry the pictures aren't the best; museum lighting is not the best for personal photos. Because it was a long day that involved a lot of walking we dressed very casually and comfortably. I wore high waist light denim skinny jeans from Charlotte Russe along with a pearl embellished sweatshirt previously shown HERE from JCPenney. Alethea wore grey sweat pants with a purple and grey mushroom onesie. 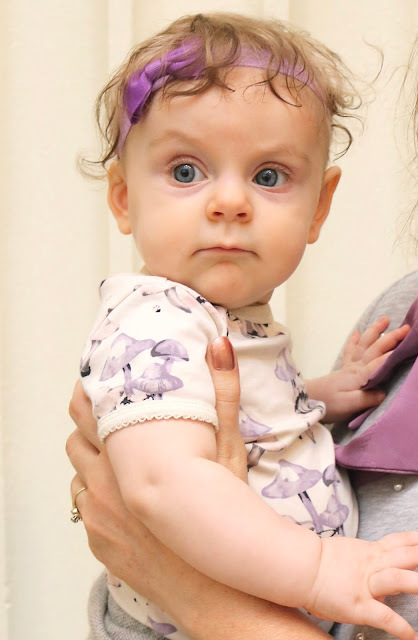 I brought out the purple in Alethea's outfit by wearing a purple neck tie and Alethea wore a purple headband. Alethea was so intrigued by the pearls in my sweatshirt...she kept trying to pick them off. haha! She also thought my neck tie was pretty tasty too! For jewelry, I wore one of my daughter's vintage bracelets. Isn't it pretty? And here she is, sucking on my neck tie. haha! Everything goes in the mouth at this age! Whenever I am with her, I can't stop kissing her! Those chubby cheeks are just so kissable! I leave lipstick kisses all over her face! I really love all the jeans I purchased from Charlotte Russe. I wear them all the time. They have held up very well. The fit is perfect for me. For $25.00 a pair (on sale) I couldn't be more pleased. Unfortunately these are sold out already, but if you need jeans next fall, check this store out! My black lace up combat boots I also got at Charlotte Russe (sold out). They were so comfortable for walking all day! This week my posting schedule will be a bit different. 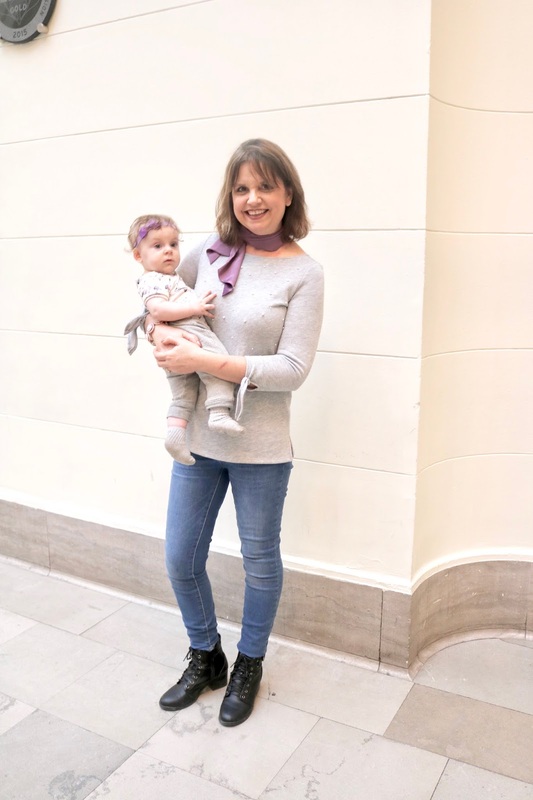 I normally don't do another fashion post until Friday but I was asked to co-host with the Ageless Style ladies for their monthly challenge, so I will have another fashion post tomorrow. Our theme is "yellow", so I hope you come back tomorrow to see how I styled this color. I will not be doing a fashion post on Friday because of the special Tuesday fashion post. I love your matching lavender accessories! SO adorable! And the pearl embellishments on your top are such a pretty detail. 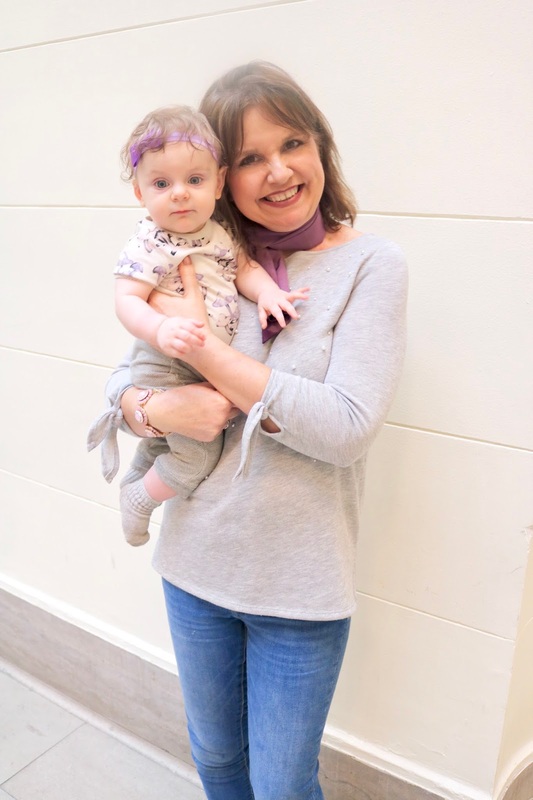 Sweet pictures of you and the grand baby! We were recently blessed with our first granddaughter -- after four sons and a grandson, she is very special! Thanks Michele! I'm sure that was so exciting for you after all those boys! Congratulations! The purple and gray combo that you two are doing is so adorable. And can I just say that I totally adore your sweater. Thanks Cheryl! I bought this sweater this season and it's one of my favs. It is so comfy, yet dressy because of the pearls. I love it. Aletha's outfit is so cute too with the mushroom print! What a fun age she's at right now, why do they have to grow up so fast!! Thanks Elli! I'm with you on the heels. I've purchased so many shoes with heels that just aren't wearable for my climate or lifestyle. I love them, but I can't walk long in them, which makes them impractical. Now, I try to buy shoes with chunky heels, wedges, or no heels at all. I actually get a lot of compliments on these boots whenever I wear them, proving that you really don't need to wear heels to look fashionable. I so agree with you on how fast babies grow up. Wait till you see next month's Grandma & Me post. She's gone from looking like a baby to looking like a little girl. 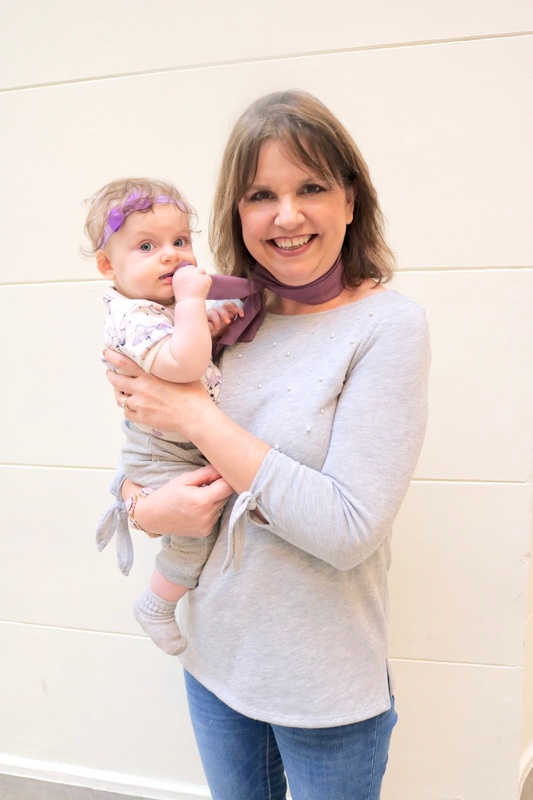 I love the lavender tones that you've been wearing on the blog. I think you look gorgeous in this pastel color! Thanks Ruth. 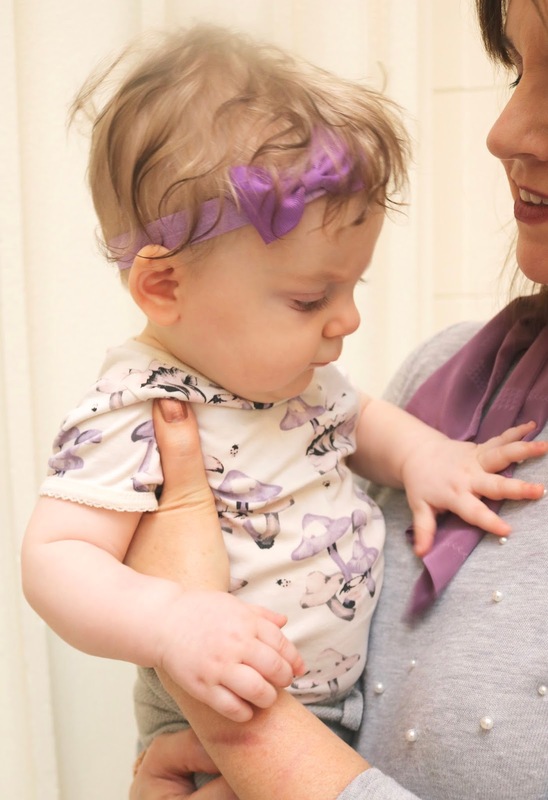 I requested lavender pieces in my last Stitch Fix, which is why I've been wearing them in my fashion posts. I really do love this color and I think it is very flattering for my skin tones. Alethea is just beautiful! You look good too. :-) Thanks for linking up at #BloggingGrandmothersLinkParty. Thanks Christie! Can you tell how much I just adore her? What a sweetie! I love matching outfits and your granddaughter is such a cutie! Love her head wrap and I believe you when she tried picking your embellishments of your sweater. My son is 4 and thinks it's still fun! Lol 😂 Thankfully your sweater remained unharmed because it's such a beauty! Happy belated Easter and happy Monday! See you back here tomorrow for your special post. Thanks Maureen! Yes, the sweater did remain unharmed. How funny that your four year old son does the same thing. Happy belated Easter to you too! She is just so sweet Amy! You are both so cute. Nothing like grandbabies I use to kiss my grands and leave lipstick. Thanks Victoria! Leaving 👄 prints on our grand babies cheeks is what Grandmas are for! You two look amazing in your purple and gray! Baby Alethea is such a little cutie pie! Thanks Leanne. I'm 5'7 and what usually happens to me is the jeans fit great until I wash them; then they're too short. These are the best jeans I ever purchased, and so inexpensive too! What darling pictures! I love the purple scarf on you and your pearl sweatshirt. such a sweet girl, your granddaughter! You two gals are so cute in your purple and grey. Love Alethea's headband. Loved when my grands would wear headbands. Darling look! Thanks Leslie! I love that Alethea leaves her headbands on! A lot of babies don't. Yes, I get in trouble too cause parents these days worry so much about toxins and chemicals and they worry about my lip stick getting into the baby's system. Parents are so much more protective then my generation or the generation before me. Amy, you and your granddaughter are just GLOWING!! I would love to see more outfits of you two together!! Thanks Laura! I'm glad you like these posts. I do a "Grandma & Me" post the first Monday of every month. Be sure to check back in May...I have a special Mother's Day post planned!